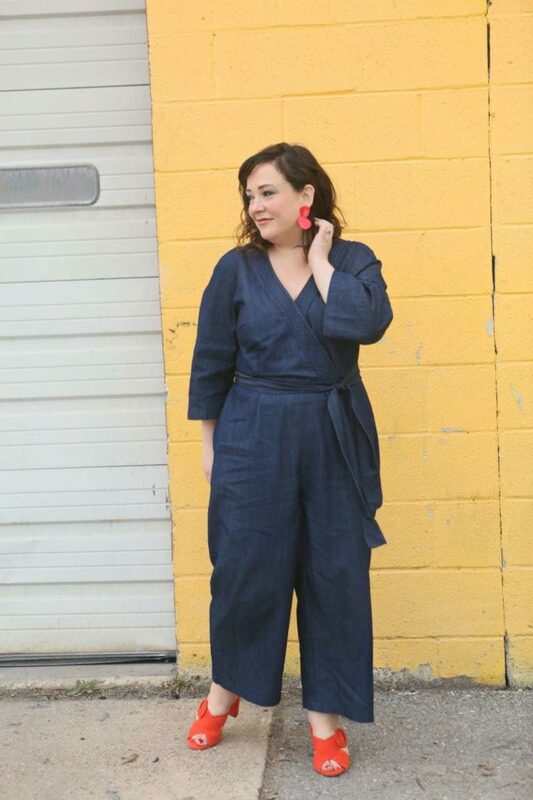 I cannot believe this is the first time I'm wearing this ELOQUII denim jumpsuit in an outfit post! If you follow me on Instagram you've seen it many times over the year. I've also mentioned it in a few posts but never gave it the attention it deserved – its very own outfit post. I'm happy to be getting fit, and it's cool to see my body change, but it's sad when items I love no longer fit as well as they used to. I wear this jumpsuit ALL. THE. TIME. It's my go-to when I want to look pulled together but also comfortable. 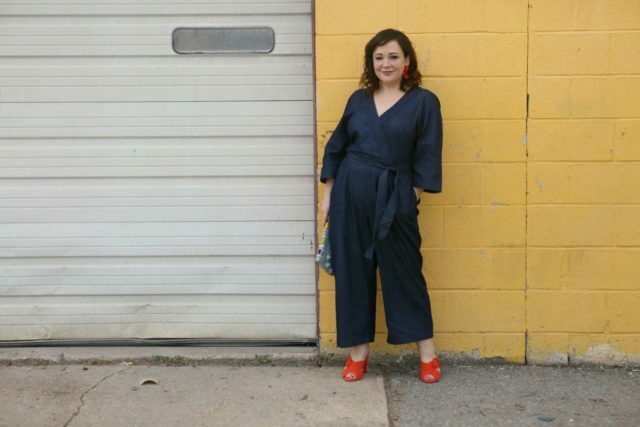 I've worn this denim juimpsuit to blogger events, to judge STEM fairs, to conferences, on date nights, and much more. It's been laundered so many times and still looks great. I once busted the zipper by pulling too hard on my Zipper Genie but had my tailor put in a new zipper because I couldn't imagine life without it. I didn't realize how loose it is on me until this shoot… to be honest there aren't any of the back view because it's not as cute as it used to be. I may take this to my tailor to see what can be done to nip and tuck here and there to keep it wearable throughout the summer because this this is AMAZING in the heat. It looks like denim, but it's lighterweight like chambray. It hides sweat, it doesn't stick or cling, and the wide legs and loose style provides some nice air flow. 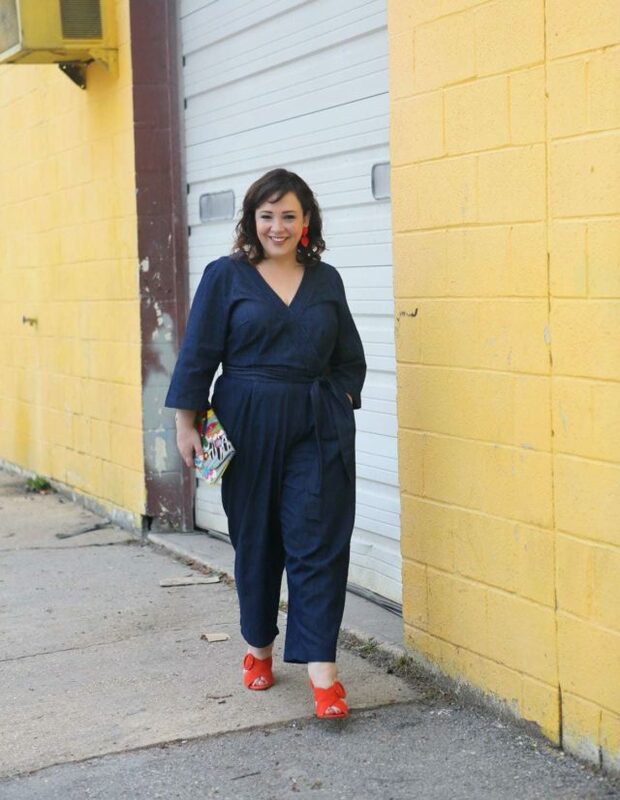 I didn't get the denim jumpsuit tailored; it's supposed to be cropped but on me it's more like ankle length. 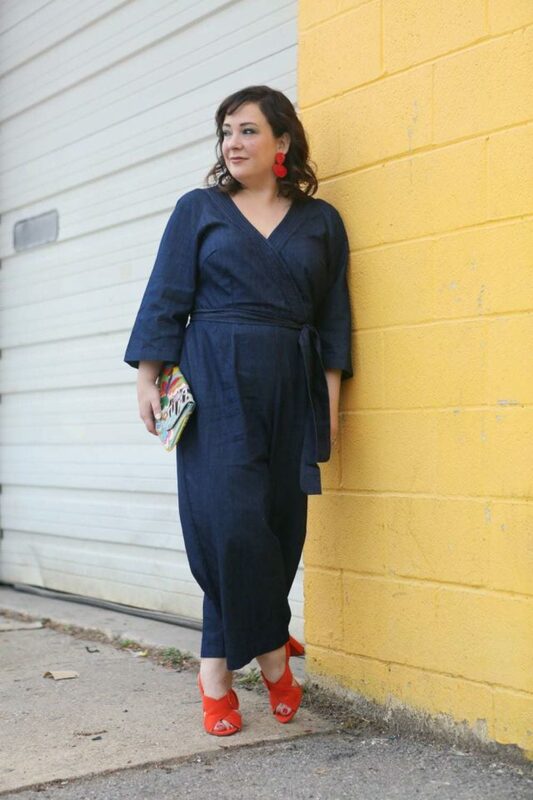 Ann Taylor recently sent me these sandals and I felt ithey would be a fun addition to this ELOQUII denim jumpsuit. These aren't the first Ann Taylor shoes in my wardrobe; for years I have found their shoes well made, to fit my wider foot, and stylish without being a passing fad. They also sent me their Dinah Suede Ruffle Kitten Sandals in Brown Toffee which is a dark camel that is a perfect neutral for spring and summer. 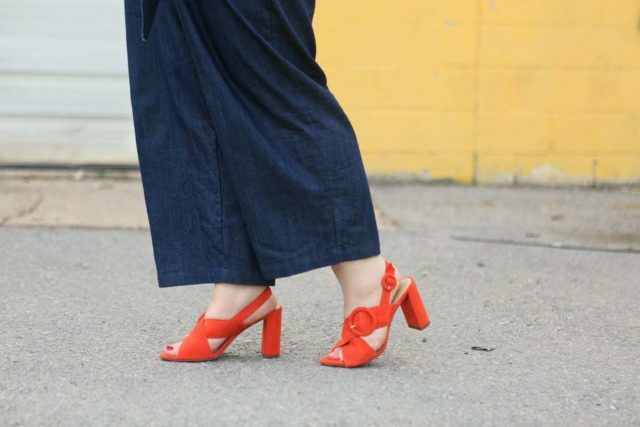 It's a shoe that will work with most every dress and pant in your closet. And I bought their Reese Leopard Print Haircalf Pumps almost a year ago and they are the perfect shape and heel height to look great while still being walkable and wearable all day. 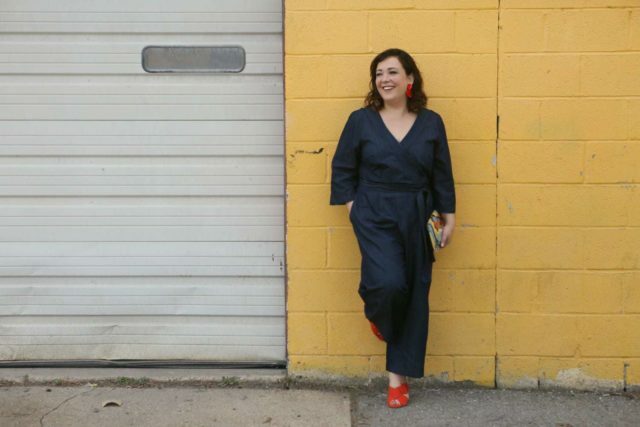 However, with this jumpsuit I've worn my Rothy's Point Flats in both black and red camo, I've worn my gold flat gladiator sandals, and I've also worn my magenta Franco Sarto sandals. Can I tell you how psyched I am that they still make this bag? This was one of my first gifted items as a blogger. I was still at the job I had when I started this blog, which means it had to be 2006 or 2007. Novica reached out and offered me a store credit and with it I bought this bag. If you've been reading this blog for a while, you know it's a favorite. it's crazy mix of patterns makes it work with so many looks. And while it's slim it holds quite a lot. In there I have sunglasses, my phone, my Dagne Dover card holder with wallet basics, a lipstick, lip balm, compact, brush, a pen, and my Zipper Genie. The lining is leopard print; there's a magnet closure at the flap, a second one inside, and also a zipper pocket. The bags are made from discarded scraps, showing how recycling and caring for our planet can be quite stylish. It's the kind of bag that always sparks conversation at an event! Sadly, at the time of writing this these earrings are no longer available in red, only black. But they're pretty spectacular because they weigh hardly anything, are only $24, and make a major impact. 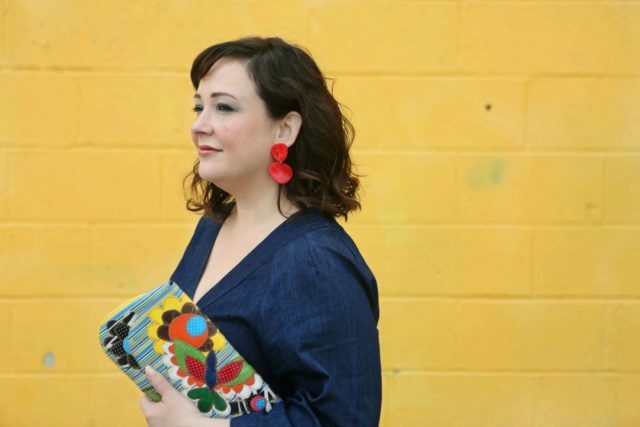 Acrylic, resin, and lucite earrings are on trend this summer, which is a win for those who don't like or can't handle heavier earrings but want something that makes a statement. Above I've shared my picks for earrings part of this trend that are all under $50. Another plus – no metal to heat up under the sun, making them excellent for the summer! Previous Post Allyn vs. Legend: Which Dagne Dover Tote is Best for Me? I love this look on you so much! 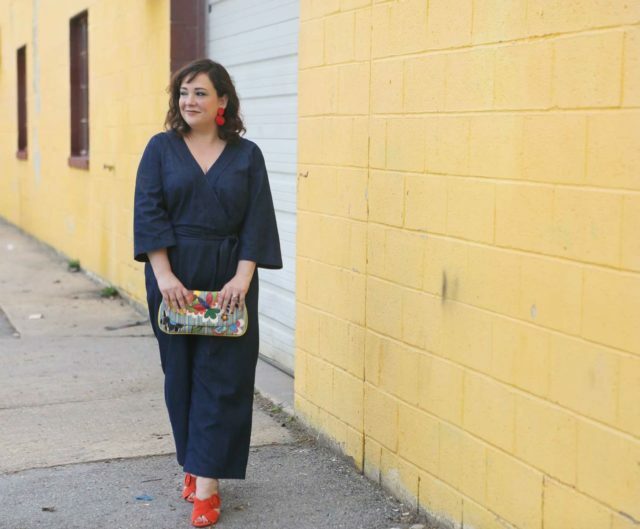 Such a versatile jumpsuit. Love it! You look great in that outfit today, but I also want to commend the choice of location – the whole visual package works really well together. I think this might be my favourite of all your photo shoots! 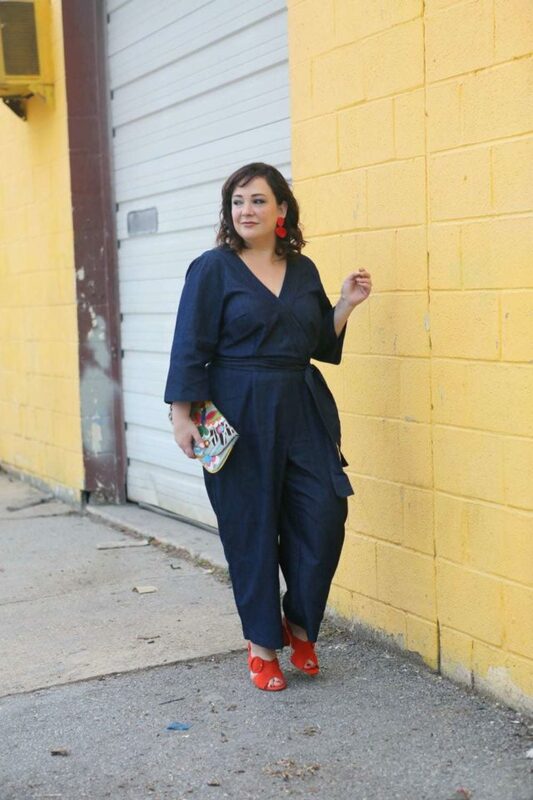 I love that jumpsuit and am curious about Eloquii, but have been scared off from trying them due to reviews from short, plus-size customers. I am 5 foot 1 and around 172 pounds. I am between a size 14 and 16 W, even going up to 18 W with some companies. I think it’s worth trying especially since they offer free shipping and free easy returns (slap on the return label sticker and it goes USPS). At 5’3″ I find some pieces, especially pants and skirts to be too big/long/designed for tall people, but I’ve had success with a lot of their tops and dresses. And I bet a lot would work with just a quick shortening of the hem!